Join us for our Christmas Eve Worship Services—Carols, Candles, and Communion. The 5 p.m. service features soloists and great carols of the season. The 8 p.m. service features music of the season with a contemporary flair. 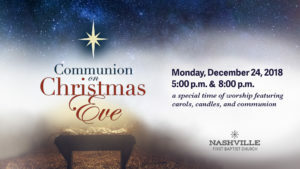 Bring your family and friends for these special times of worship designed to draw us closer to the Christ of Christmas.